In my long, candy making career, a use of a candy thermometer was a must for me during the preparation process. That is, a must, until my last one broke, a couple of years ago. Since then, I've been talking constantly to my husband about the fact that we don't have it anymore, hoping he will buy one for me. Two years have passed, and I still didn't have it. So I stopped expecting and decided to get one myself. I conducted a thorough research and found the perfect one. During the research process, I improved my knowledge of food thermometers, so I will give you some facts and describe how I choose the best candy thermometer for my needs. What Is A Candy Thermometer? Why Should You Use A Candy Thermometer? What to Look for in a Candy Thermometer? How to Use a Candy Thermometer? A candy thermometer is a thermometer which we use to measure the temperature (and stage) of a cooking sugar solution so that the right temperature is achieved for preparing our candies. Sometimes it is also known as a deep fryer thermometer, sugar thermometer, or jam thermometer. Candy thermometers are similar to meat thermometers, except that they are calibrated for higher temperature ranges required for candy making. 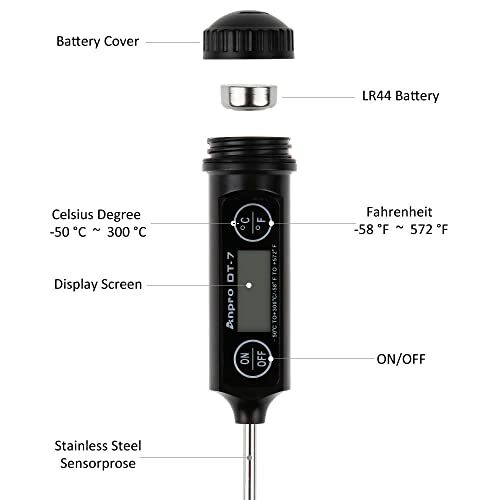 There are many multipurpose thermometers on the market, that can measure the temperature of hot oil when deep frying, the temperature of meat, bread, liquids, and candy. That is usually stated in their name, like candy/deep fry thermometer, meat thermometer with a long probe for food, meat, candy and bath water, etc. I know many of you have doubts about the usefulness of the candy thermometer. But candy making is a process that demands following a set of strict rules so that the optimum results are achieved. The temperature of the sugar syrup plays a crucial role in that process. That is why it's important to have a good, reliable thermometer, to secure the success of our candy recipe. Do you need it for just candy or other purposes also? What type of pot you'll be using it in? It's important to choose a thermometer that is safe from touching the bottom and is also long enough to read the temperature of the content. Do you need a digital or an analog type? Digital have their advantages and additional features, but analog are just as good in doing its main purpose, which is measuring temperature. Should it be a glass or a metal thermometer? Glass is more fragile, other than that, there's not much difference. The answers to these questions are important if you want to end up with just the right product for you. For example, I already have a digital Acurite meat thermometer, which I bought online. I found it on the Home Depot thermometers page. I absolutely love it, and it's perfect for my meat. But that's no wonder. 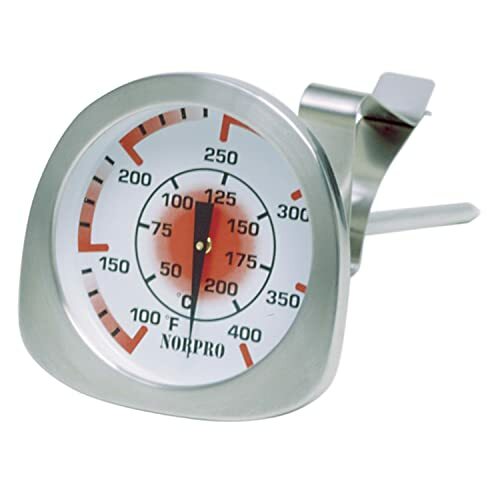 Acurite meat thermometers are known for their quality. I can use it for other purposes as well. But for candies, I needed a special one. There are different types of analog and digital thermometers. They can be made of glass or metal and all have their "Pros" and "Cons". They contain mercury or spirits which react to heat and move through the thermometer to deliver a reading on the dial or the scale. Take longer time to read the right temperature. Have an easy to read digital display. Read temperatures and deliver results electronically. Some types come with an alarm which informs you when a certain temperature is achieved. Some models of thermometers even have markers for different stages of candy making, such as soft ball, firm ball and hard ball, or soft crack and hard crack stage. This feature is very useful, because you don't want to leave your sugar in a liquid state or make caramelized sugar, and ruin the candy. Usually, they are tube – shaped, and they have a clip, so they can be hooked onto a pot where they stay during cooking. Some glass thermometers have protectors around them, to prevent breaking and also to prevent the thermometer from touching the sides of the pot during cooking. Some of them are mounted onto a metal or stainless steel backing, which also helps prevent the glass from breaking. The backing can sometimes include temperature zones for different stages of heat, which is a useful feature. 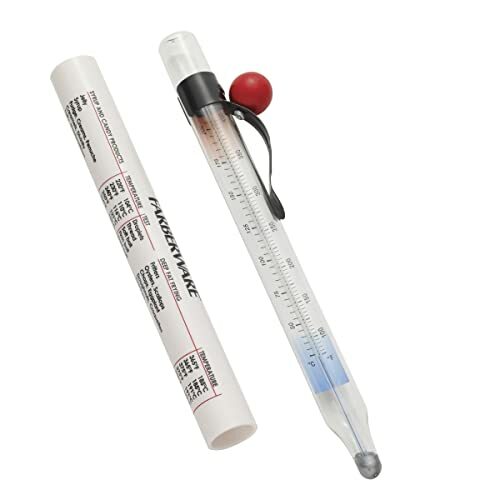 Usually, this type of thermometer has a 7 – 8-inch probe. Analog metal thermometers usually have a round dial face for the temperature reading. They usually have clips for attaching onto the pot. Digital metal thermometers have a case with a display for temperature reading and a metal probe. Both analog and digital thermometers need frequent calibration to assure the accuracy. Analog thermometers need to be calibrated more often, and digital thermometers are reliable for a longer period of time. The usual method is putting the thermometer in freezing or boiling water and then manually adjusting it if the option is available on your thermometer. If not, the only option is buying a new one, because you want your readings to be accurate. For candy thermometers, you will probably be using only the boiling water method because most of them don't have a reading for freezing. It's important to remember not to plunge the thermometer into the boiling water because it can break. The sugar syrup should be put to boil over medium – high heat. When the solution is at full boil, the heat should be turned to medium again, but it should continue to boil. At that point, the candy thermometer should be inserted. It is imperative to keep the thermometer from touching the sides or the bottom of the pot, for the reading to be accurate. Also, touching the bottom of the pot may ruin the thermometer. The mixture should boil until it reaches the required stage, and should not pass it because if it does, that means that you have ruined your candy. Upon deciding I was no longer going to wait for my husband to buy it for me, I started researching for the best candy thermometer to fit my needs. This is a stainless steel, multi-functional digital thermometer, which is a great feature if you need it for different purposes. It has a large LCD and easy-to-read digits, which help read the temperature easier, faster and more precise than on analog thermometers, a feature that I like a lot, being used to analog thermometers. The total length of the thermometer is approximately 8 inches. 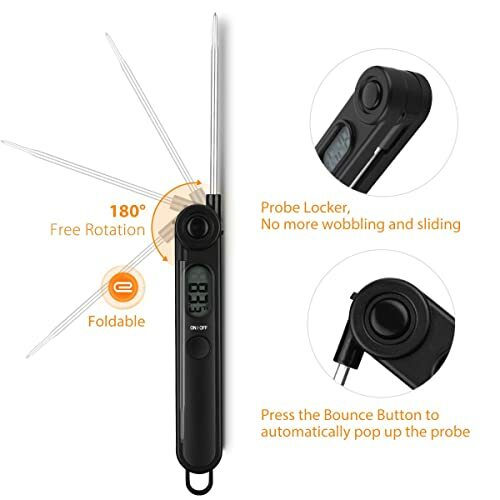 It has a 4.90-inch slender probe, which should be long enough to help prevent hand burning, and I believe it can be very useful for candy making because sometimes the probe needs to go deep into the pot. The thermometer has an extensive temperature range (-50 °C to +300 °C). Of course, for candy making only the +200°C to +300°C range counts. It should be cleaned with a damp cloth, before and after use, and should not be immersed in water, because the display could stop working. The cover has two holes at the bottom, which is a great feature that allows the thermometer point to dry if it’s not dried completely before storing. The thing that I didn’t like at all is the fact that it doesn’t have a stainless steel clip so that it can be attached to the side of the pot. It only has a plastic clip on the probe’s cover which is useless in cooking. Because of that, hand burning is a strong possibility. This analog alcohol thermometer is huge and seems sturdy. It's around 15 inches in length, so it's not suitable for small pots. Also, it has a nice clip to hold it to the side of the pot, which can also slide up or down the thermometer to adjust to the depth of the pot. The glass part seems brittle, though. The thermometer has both Fahrenheit and Celsius readings, and it also has "shortcut" readings, such as "thread", "soft ball", "soft crack", "hard ball", "deep fry", etc., which is a great feature for candy making. The minimum temperature reading is 90 ° F (50° C), and the maximum is 400° F (210° C), although it seems a bit inaccurate, which is crucial in candy making. It seems to me it's better for deep frying than for candy making. The good thing is that it can be calibrated. It's labeled as dishwasher safe, but I didn't want to test my luck. You better soak it first and then scrape the remains. It cannot be used in an oven because it has a plastic part on the top that would melt. It's easy to read, but the numbers seem to come off quickly. The edges are sharp, so you have to be careful when using it not to cut yourself. This one is also a digital thermometer, with a long stainless steel folding probe (3.9"), and a total length of 10.15", which is a good size. It is very easy to use, takes only inserting the probe inside the food or liquid. You should be careful not to touch the bottom with the tip of the probe. It should also never be used in a closed oven. It reads both in Fahrenheit and Celsius on its LCD in just 5 seconds. Just switch the on/off button. Also, it has an auto shut - off feature that works on the 10-minute mark, which is great for saving the battery. I also like that it uses a standard AAA battery and has a hanging hole for storage. The folding probe is also a great feature. It has a high-temperature range, which goes from 49F to 392F or 45C to 200C, but seems better for quick checking than as a constant temperature monitor, which is required for candy making. Also, this thermometer cannot be calibrated. It should never be immersed in water and should be cleaned with a damp cloth before and after use. The price is also very affordable. Considering all its features if you need a quick checking thermometer for a variety of foods it can be a decent option. This one is an analog glass tube thermometer for candy and deep fry, with a protective cover and a total length of 11.8 ". It has a clip, so you can attach it to the side of the pot while cooking, but it's not very reliable, and doesn't hold well on the pot. I tried it in several pots, but it couldn't stay straight, and I was afraid I would burn myself. The temperature range is 100 F to 400 F, but it was very hard to read it because the steam easily goes inside, fogs it, and makes the numbers unreadable. Also, I had a feeling that it took a lot of time to measure the temperature and it doesn't seem accurate. The top of the thermometer easily pops off so never immerse it in water because the paper inside will get wet. On the back, it has a magnet so you can mount it on the refrigerator or stove, which is a feature I really liked. I didn't like that it is made of glass that seems very fragile, and the overall feeling was that it could be easily broken. This is a stainless steel analog candy thermometer approximately 9 inches long. The stem is 5.75-inch long. It has a metal clip so you can attach it to the side of the pot. The clip fits great on the edge of the pot, and its adjustable. You can adjust it so that the probe tip is right at the bottom of the pot. According to my opinion, that it is the best feature of this product. It seems very well made and easy to use. Easy to read also. It has both Fahrenheit and Celsius readings on the measuring scale, which ranges from 100 to 400 ° F. It reaches higher temperatures required for candy making with no problem. It is very easily cleaned, which is a greatly appreciated feature for me. All you need is to put it in hot water, and the sugar residues get off. It is obvious just from the way it looks that this thermometer is made for candy making purposes only. The design, the material it is made of, the adjustable clip, everything about it. I enjoyed using it while making my kids' favorite fudge. It performed perfectly, just as I had expected. In the end, after trying out these five models, I decided which one is the best candy thermometer for me. Since I already have a meat thermometer that I can use for other purposes, and I only needed a candy one this time, for my needs I chose the Norpro ﻿Candy﻿ Thermometer. It's well made, durable, clips easy onto different pots (e.g, Red Copper, Copper Chef, Gotham Steel) and it's easy to read. I bought my new candy thermometer on Amazon.com. Actually, I bought two same thermometers. It was an easy pick after my research. Now I'll never worry when I'm making my candies because I have a spare one. Hope this one is going to be my best candy thermometer ever. 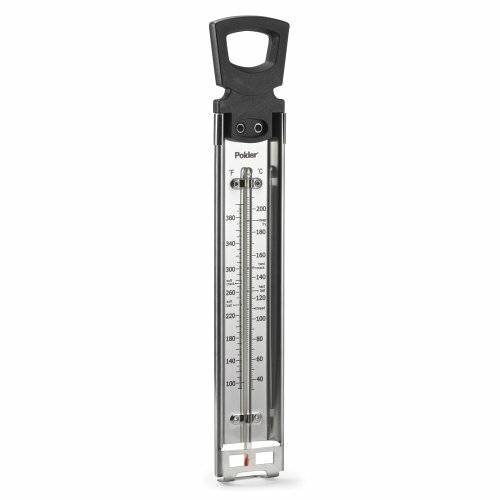 If you require a multi-purpose thermometer, because you predominately want to use it for checking your meat, BBQe, milk, water or for some other use, I would recommend you purchase the Habor ﻿﻿CP019. I personally think it has great attributes and would buy it for myself if didn't already have one. Thank you so much ! I realized my old thermometer wasn’t calibrated right when my marshmallow crepe frosting turned into a solid marahmallow the next day. I waded through tons of websites to help pick a new one and this one gave me exactly the info I was looking for.